IIf you are a home handyman, or just like to take some of your own initiative, you need tools, and you need lots of them. However, that is not all, because you also need a place to put those tools. After all, you can’t just leave them lying around. That is why we are here today, to find the best tool chest for home and garage available on the market today. 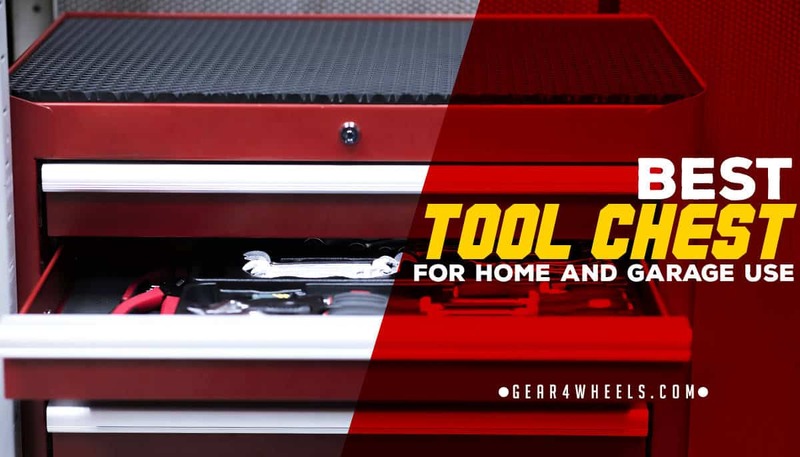 This is a very simple yet effective high-quality tool chest to have in your home or garage. It is not huge and doesn’t have room for big things like power drills, but for all of your smaller tools, it really is a great option. 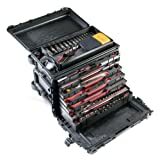 This is a hard plastic mobile tool chest with 7 drawers and a top section, ideal for organizing sets of smaller tools. The Pelican Mobile Tool Chest is made out of very hard, durable, and sturdy plastic. It definitely keeps the tools on the inside safe and sound, not to mention that it can handle some punishment with ease. In fact, this whole thing is made with high-quality materials that are shown to withstand the test of time. The whole thing weighs over 45 pounds, so you know that it has some heft to it. The Pelican Mobile Tool Chest is of course mobile, which is pretty convenient, even if you do just want it for some home and garage work. It comes with extremely sturdy plastic wheels that can handle a fair amount of weight. At the same time, it comes with a nifty handle, so you can easily pull it around from one location to another. This tool chest also features heavy duty buttress hinges for easy and secure opening, plus it has hybrid double butterfly latches to keep your tools exactly where they are supposed to be. The 7 drawers of the Pelican Mobile Tool Chest are pretty neat too. They have ball bearings to make them slide easily, which is always convenient. The drawers themselves are not very tall, so they are only ideal for sets of smaller tools like screwdriver, wrench, or ratchet sets. You won’t be fitting any power drills into this thing. It does however have a top compartment with a lid for a bit of added room. The foam inserts for tools shown in the picture is not included here. If you need a really nice looking storage chest made of real steel, one that is ready to handle a good number of tools, the high quality Milwaukee 46 in. 8-Drawer Steel Storage Chest might just be the right option for you. This is a metal tool chest with a top section, several drawers, and one heck of a solid build. The fact that the Milwaukee 46 in. 8-Drawer Steel Storage Chest is made of real steel is something we can all appreciate. Steel is durable, it’s strong, and it will keep the tools on the inside as safe as can be. Speaking of safety, the top chest portion of this bad boy can lock, plus the drawers are also lockable too. Nobody is going to steal your tools if you have them inside of this particular tool chest. Speaking of the drawers, they use an advanced ball bearing system in order to help them glide smoothly. The drawers each feature anodized aluminum drawers pulls and premium drawer liners. Each drawer can hold around 100 pounds of tools with ease. It features 1 medium wide drawer, 3 small wide drawers, and the equal number of narrow drawers. It even comes with a pullout work surface for your laptop. The space under the lid of the Milwaukee 46 in. 8-Drawer Steel Storage Chest is big enough for some power tools, which is always nice. Also under the lid is a power bar station so you can plug in your power tools right then and there. The recessed steel wing handles included with this tool chest make it fairly easy to move from one place to another. 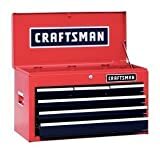 This is a great high quality and heavy duty tool chest that comes to us courtesy of the highly trusted Craftsman brand name. A lockable tool chest with several drawers, ball bearing slides, and an overall durable build. As the name of the Craftsman 6 Drawer Heavy Duty Top Tool Chest implies, it has a total of 6 drawers, plus some space under the top lid too. The drawers are each set on ball bearing slides, which makes them very easy to open and close. The drawers all feature a DynaGlide system in order to make them smooth, plus to make sure that they don’t open and close when you don’t want them to. Each of the drawers can hold quite a bit of weight, so there is no issue there. To be clear, there are 3 small drawers on top for organizing little parts, 2 medium drawers in the middle for tools, and 1 large drawer on the bottom for larger tools, maybe even a standard size power drill. The Craftsman 6 Drawer Heavy Duty Top Tool Chest features a heavy-duty construction. It is made with real steel and can definitely withstand quite a beating. To make sure that your tools are safe and secure at all times, this particular tool chest comes with a keyed locking system. Nobody will get into your tool chest when it is locked. 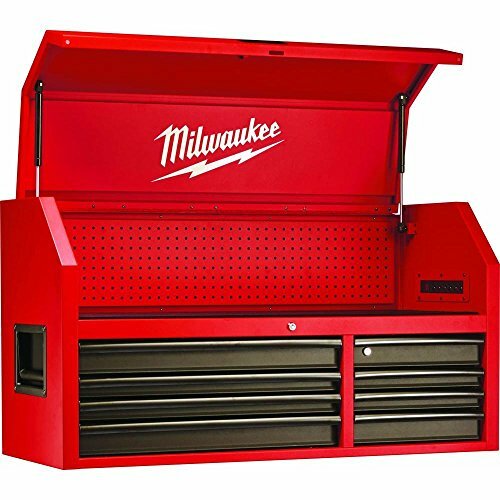 To make it a little easier to carry, this tool chest also comes with recessed aluminum handles. When it comes to the best tool chest for home and garage, the Pelican Mobile Tool Chest is the most highly recommended option around. It is very durable, it is mobile, user friendly, and much more. If you need a good tool chest for home use, it is in our opinion the best option you could go with at this point.